The NBE bulk bag discharger uses two integrated hydraulic massage paddles, each with 2,200 pounds of paddle pressure, to condition the material and aid material flow. The material flows through the NBE E3™ enclosed bag spout interface where the closed-cycle dust collection system filters migrant material generated during bag unloading and re-introduces the material back into the process flow. 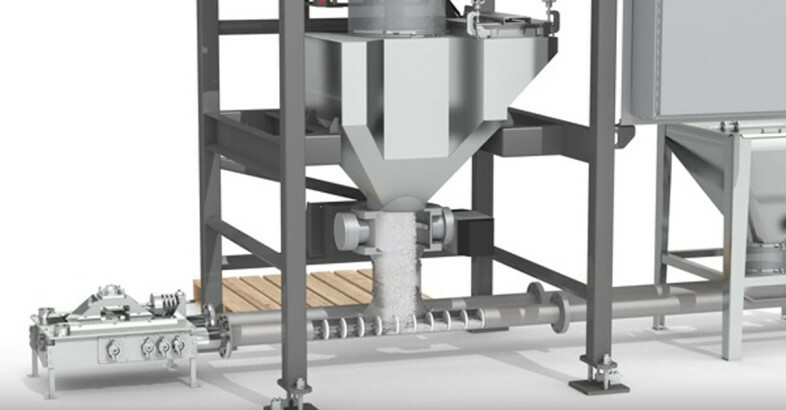 The E3™ also works during bulk bag unloading to elongate the bulk bag, further ensuring complete material discharge. Changeover times are reduced as a result of NBE bulk bag discharger sanitary design features, including: the elimination of internal angles, corners, and dead spaces to reduce accumulation of contaminants; and angled planes, rounded-radius framework, 32 Ra finish plate, and stand-offs to speed moisture run-off away from product contact areas. Subassembly access, removal, and replacement is engineered to be completed as a single-operator, tool-less action that reduces time and labor per event. The chain-style tubular drag conveyor minimizes product breakage and degradation while providing a dust- and air-tight material transfer method. Integrated clean-in-place capabilities are provided by an automated CIP cart which enables a complete washing and drying procedure and aids in meeting regulatory requirements for food-grade system design. Despite bulk material process demands requiring more frequent changeovers, the total line uptime and throughput performance of this operation increased due to significant reductions in the time-per-changeover event. 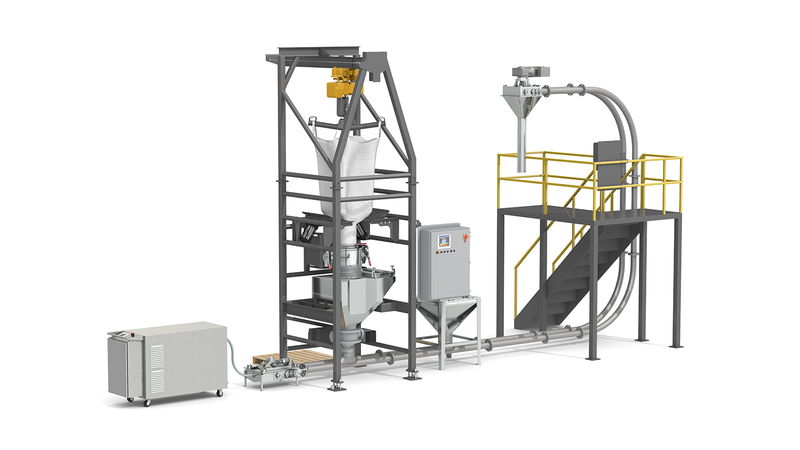 Process safety and product safety gains have also been realized from the NBE bulk bag unloader and conveying system. The bulk bag discharging, material conditioning, feeding, and filling systems protect operators by preventing migrant material dusts from entering the process area. The enclosed design also protects process material from contamination.